English: Maize (Zea mays L. ssp. 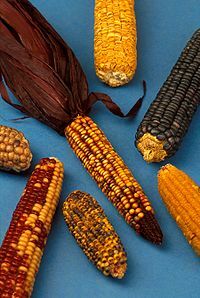 mays) or corn is a large cereal grain plant domesticated in prehistoric Mesoamerica and subsequently spread throughout the rest of the world. The leafy stalk produces ears which contain the grain, which are seeds called kernels. Maize kernels are often used in cooking as a starch.